Where to buy sodium hypochlorite? Manufacturers of sodium hypo. From a chemical point of view, sodium hypochlorite is a hypochlorous sodium salt. Otherwise it is called sodium chlorate. This substance has been known for centuries and is considered to be the oldest and most important bleaching agent in the world. The oldest bleacher. How does sodium hypochlorite work? The bleaching effect obtained by using sodium hypochlorite results from the specific mechanism of decomposition of this substance. Soaking the fabric in an aqueous solution of sodium chlorate (I), in contact with the carbon dioxide contained in the air, starts the whole process. Then, on the surface of the material sodium hypochlorite reacts with CO2, which results in the formation of sodium bicarbonate and hypochlorous acid. The latter, as a result of decomposition, oxidizes with the help of oxygen contained in the fabric dyes. However, sodium hypochlorite is not just a bleach. Its spectrum of applications is so wide that almost every industry makes use of it. How is sodium hypochlorite formed? The first synthesis of sodium hypochlorite took place in 1789 in Paris. The reaction consisted of passing gaseous chlorine through a sodium hydroxide solution. In the process, sodium chloride was formed as a by-product (in addition to aqueous sodium hypochlorite) and was removed from the reaction medium. The currently used method of producing sodium hypochlorite on an industrial scale is electrolysis of brine. This is an improved primary method of synthesis. In this process, sodium hydroxide and chlorine gas are formed, the latter of which is then passed through an aqueous solution of sodium hydroxide. As a result of the saturation of the caustic soda lye by the chlorine gas formed, sodium hypochlorite is produced. Manufacturers of sodium hypochlorite commonly use the addition of sodium hydroxide to the finished product in order to slow down the chemical decomposition of hypochlorite. What does sodium hypochlorite look like? Sodium hypochlorite can occur in several forms. The most unstable form of this inorganic chemical compound is anhydrous sodium hypochlorite, which causes an explosion when decomposing. The factors accelerating this process are friction, moisture, heating and contact with carbon dioxide. The danger posed by the storage of sodium hypochlorite in the form of an anhydrous chemical compound prompted scientists to try to crystallize this substance. As a result, they were able to obtain a stable pentahydrate in the form of a light-green-yellow solid. However, this form was also not completely safe, as it required the substance to be stored under appropriate conditions, including at a reduced temperature. Therefore, the most popular present form of sodium chlorate (I) is its green-yellow water solution. Sodium hypochlorite suppliers transport this substance only in liquid form because it is characterized by the highest stability at ambient temperature (compared to other forms). What are the physicochemical properties of sodium hypochlorite and where can it be used? Sodium hypochlorite has a sharp, characteristic smell of chlorine. Sometimes it is also described as sweetish. This straw-coloured liquid has strong corrosive and oxidizing properties. These capacities of sodium chlorate (I) are used in organic chemistry, inter alia, for the production of modified starch products, for the preparation of sulfones, sulfonyl chlorides or phenol decolorization. Sodium hypochlorite is also used in inorganic and coordination chemistry for the oxidation of metals and their complexes. Sodium hypochlorite has a cleaning, whitening, deodorizing and caustic effect, resulting from the hydrolysis (saponification) and oxidation of impurities. Dirt of organic origin under the influence of this substance becomes non-volatile and soluble in water, which facilitates its removal without an unpleasant odour. In addition, the hypochlorous sodium produced in the PCC Group is characterized by a very high content of active chlorine – above 150g/l. Disinfecting and antibacterial properties of sodium hypochlorite have enormous application possibilities in various branches of industry. Sodium hypochlorite is most often used in household chemistry as an antibacterial, disinfecting and bleaching agent. Products for cleaning and protection of toilets containing sodium hypochlorite, which acts as a solvent for sanitary and technical deposits, are very popular. In households, sodium salt of chlorous acid is used to remove mildew from walls, tea stains from dishes, and other types of stains. In the industry, it is used to disinfect drinking water and water in swimming pools, ponds and bathing areas. It is also used for the disinfection of systems, tanks and pipelines in the dairy, brewing and wine industries. Hypochlorite is also used for bleaching fabrics, paper, cleaning industrial waste, removing organic and inorganic impurities. Not only textiles, but also leathers and animal bones are bleached. In health care facilities, sodium hypochlorite is widely used for its antimicrobial and biocidal properties. It is also used for disinfection of rooms in cases of contamination with blood or other body fluids. In medicine, it is intended for local and external use, in the treatment of wounds, mucous membranes and skin. In dentistry it found use as an antiseptic in the treatment of caries. Sodium hypochlorite is used to synthesize many organic compounds. It reacts with reducing agents, strong acids, organic compounds, metals and cellulose. It is also active with most nitrogen compounds, forming volatile chloramines or nitrogen trichloride. In addition, it is used as a reagent in photometric studies. In fact, the effect of sodium hypochlorite on humans should be considered in two ways. First of all, how does it work directly on human tissues? And secondly, how to use this substance in a safe way to avoid indirect effects on the body? Sodium hypochlorite as a strong oxidizer causes skin burns and eye damage. This is because it degreases and saponifies substances that make the skin elastic, and then destroys other tissues. Concentrated forms of this substance are especially dangerous. Even solutions with a concentration of 40% are classified as dangerous for human health and life. Therefore, extra caution should be exercised and personal protective equipment should be used when in contact with this substance. It is absolutely necessary to wear gloves and safety glasses that protect against burns. Sodium hypochlorite can be dangerous if mixed with other household cleaners. Sodium hypochlorite solutions, such as bleaches, can, due to heating or by reaction with other preparations (e.g. vinegar), release toxic, gaseous chlorine. This combination can cause gas poisoning and loss of consciousness. The combination of cleaning and disinfecting agents that emit volatile organic compounds can cause cancer. Mixing hypochlorites with amines is particularly dangerous. Gaseous products formed due to combining these compounds can cause lung damage. The greatest risk is associated with the use of bleaches with methanol, formic acid or phenylacetonitrile, as the reactions of these groups of compounds are explosive. What is the effect of sodium hypochlorite on the environment? The effect of sodium hypochlorite on the environment is limited. This is due to the degradation of the hypochlorite ion, which before being absorbed by living organisms, disintegrates. The persistent chlorinated organic compounds formed as a result of the modification of sodium hypochlorite are more dangerous. They are classified as carcinogens that can be absorbed and metabolized by fauna and flora. This can happen, for example, when mixing bleach and sewage from different farms. Such a mixture is an environment rich in various chemical compounds of organic and inorganic origin, which are a source of chlorinated compounds. What are the current and forecast sales of sodium hypochlorite? The factors determining the price of sodium hypochlorite in the world are raw materials, operating costs, transport costs and competition. In the world, the Asia-Pacific region dominates the market of sodium hypochlorite. The prices of this chemical compound are the lowest in China. This is due to the easy availability and low cost of raw materials, labour and the competition of numerous producers present in this market. The estimated trend of consumption of sodium hypochlorite in the world is increasing, despite the need to comply with different regulations. However, the increase in industrialization increases the demand for treated water, which is the main application of sodium hypochlorite. Sodium hypochlorite is formed in the process of chlorine saturation of aqueous sodium hydroxide as a by-product in degassing the installation. Almost all electrolysis in the world operate in this way, including the installation in the PCC Group. It is therefore, difficult to assess which producer of sodium chlorate (I) is the largest. There are only two producers of sodium hypochlorite in Poland. These are PCC Rokita, with a daily production capacity of 60-120 tons/day, and Anwil (Orlen Group), producing a maximum of 80 tons/day. Taking into account the production capacity and the actual annual sales of sodium hypochlorite, it can be concluded that the PCC Group is the largest producer of sodium hypochlorite in Poland. The majority of producers of sodium hypochlorite operating in Poland sell it on the domestic market, covering the entire demand for this product. Some producers decide to export sodium hypochlorite, although, on a very small scale. The countries to which Polish companies export sodium chlorite (I) are mainly neighbouring countries, namely Lithuania, the Czech Republic, Slovakia and Ukraine. This is due to the large costs associated with the transport of this substance, as it requires the use of special equipment for tanks. And because of the low price of the product and long distances it is not very profitable. Another factor that may limit the sale of sodium hypochlorite outside Poland is its durability – the product shows stability for about a month. The period of time in which the product retains its durability, significantly shortens at an elevated temperature accelerating the process of decomposition of this substance. In the so-called season – from May to September – the sales of sodium hypochlorite increase. This is due to the increased demand of consumers who open swimming pools. They use this chemical for disinfection and prevention of water bloom. About 50,000 tons of sodium chlorite (I) are sold annually in Poland. The PCC Group is the largest and most stable producer of sodium hypochlorite in the country. In 2017, over 3,500 tons of this substance was produced in these chemical plants. Currently, producers of sodium hypochlorite have greater production capabilities than indicated by the market demand. These capabilities are around 60,000 tons per year. Most manufacturers are looking for new substances that are substitutes for chlorine derivatives, but as yet they are not popular. Substitutes on the market are chlorine gas and calcium hypochlorite. Where can I buy sodium hypochlorite and what is its price? In the PCC Group, which is a producer of sodium hypochlorite, you can buy this raw material with the highest quality guarantee. The production takes place in the Chlorine Business Unit of the PCC Rokita SA in Brzeg Dolny. The installation of membrane electrolysis is one of the newest and most modern in Europe. Thanks to the use of advanced technologies and careful handling of the process, the produced sodium hypochlorite meets the expectations of the most demanding customers oriented primarily on quality. prepare a favourable price offer. The producer’s individual approach to the customer and the exact identification of his needs is usually a guarantee of long cooperation. 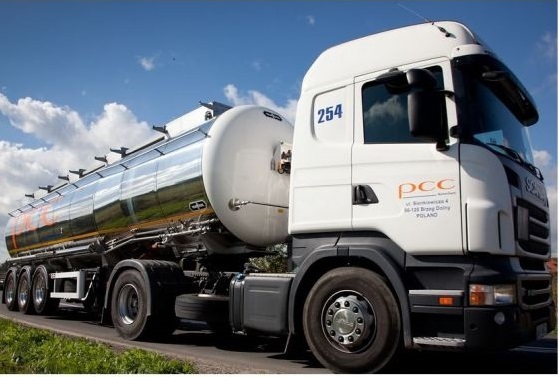 For this reason, any current or potential client of the PCC Group can receive an individual offer and negotiate the price of sodium hypochlorite. Simply fill out a short form, call or write an e-mail, and company experts will contact each client individually and prepare an offer. In the PCC Group, it is possible to purchase both small quantities of the product and wholesale quantities. If you are wondering where to buy sodium hypochlorite, visit our website. All information about sodium hypochlorite, which is a permanent item in the PCC Group offer, can be found on the PCC Group Product Portal (www.products.pcc.eu) or by clicking the link below. Meet the best supplier of sodium hypochlorite, a leader in the chemical industry! Find out about the potential uses, delivery conditions, availability and price of sodium hypochlorite. How to store sodium hypochlorite? It may also be a packaging made of other corrosion-resistant materials. Otherwise contact of the solution with reactive raw materials (e.g. metals) could result in the production of hydrogen gas that is flammable. Sodium hypochlorite should be stored in shady and cool places, away from direct sunlight and other sources of heat. Heating the solution in the container would release toxic oxidizing substances, which could result in an explosion. At 25˚C, oxygen is released from the sodium hypochlorite solution, at 35˚C – chlorine and at 100˚C – chlorine dioxide. Therefore, the temperature at which sodium hypochlorite is stored should not be higher than 23˚C. This substance is also destabilized under the influence of acids and heavy metals, such as nickel, chromium, iron or manganese. For this reason, it is important that the product has the highest purity, which translates into its high quality. Containers should be constructed in such a way as to enable the removal of oxygen formed during decomposition of hypochlorite over time, otherwise they may break. It is also important that carbon dioxide does not get inside the packaging. Sodium hypochlorite should be protected from moisture. Water enhances the corrosive effect of this substance, changing the properties of the final product. Proper storage guarantees slower degradation processes and maintains the stability of this chemical for a longer period of time.